I used to think growing fruit and in particular growing raspberry’s was the domain of only the most experienced gardeners. That was until a few years ago when I bought a handful of summer and autumn fruiting bare root plants from my local nursery. Several years on and they have multiplied and multiplied … and multiplied! I must have over fifty by now which is fine but if they’re to carry on providing us with gorgeous fruit they’ll need thinning out. We prefer the late summer/autumn fruiting varieties as they are easier to manage and in my experience produce more fruit. 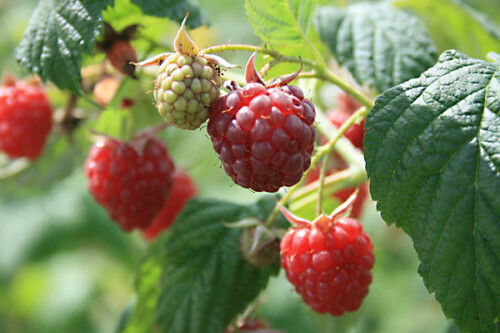 Essentially autumn fruiting raspberry’s fruit on this years growth which means you cut them hard back leaving approximately nine inches of stems after the first frost. The bed they are in at the moment is right outside the poly tunnel and slap bang in the middle of what has become my little back garden nursery. Not exactly the best position although the canes produce absolutely loads of fat gorgeous tasting raspberry’s that seem to go on forever, but they’re going to have to be moved. This year I’ve decided to move them to a new plot to give me a bit more space for the nursery. 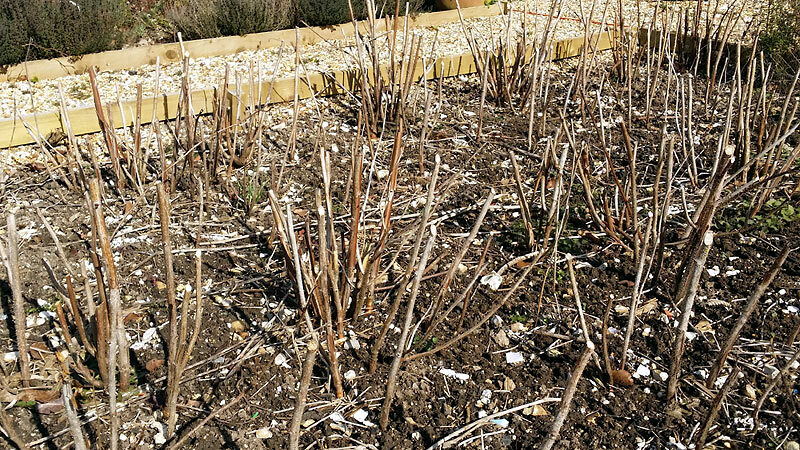 I’ll keep the surplus plants and plant them along the hedge at the bottom of the plot and then anyone walking down the lane can help themselves. 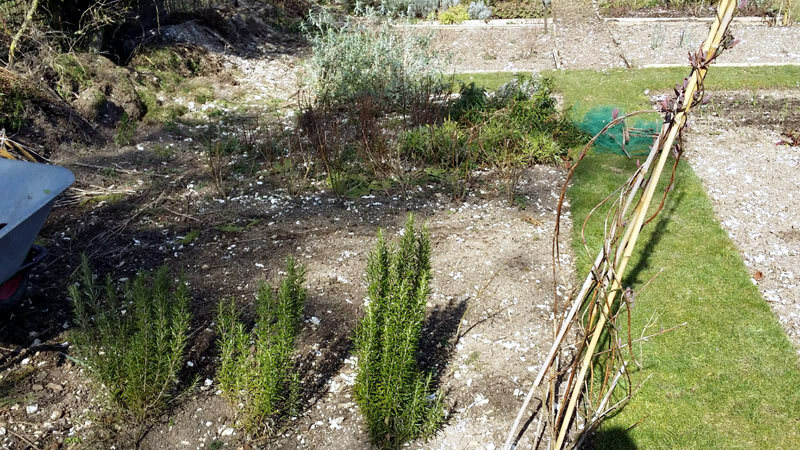 Here’s the new plot … As you can see it’s going to need some work to get it ready. Its not really been used for anything other than as a temporary holding bed for the nursery.Now it will get a new lease of life and provide a permanent home for the razzas . Do rasberrys need any special treatment? Two important things to remember about Raspberry’s. One, they are heavy feeders and two they hate to dry out. They thrive on moisture which if you consider they are mostly composed of water it does kinda make sense. So they need muck or compost … and plenty of it. I find about now (early – mid March) to be the ideal time. Why? 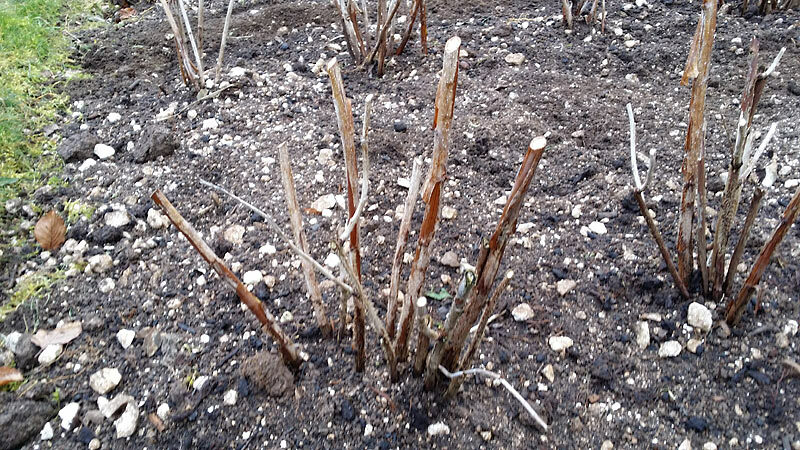 Because we are still having frosts in Hampshire which means the canes are still fairly dormant and the plants will have plenty of time for the roots to settle into the new conditions before they start to bear fruit. Prepare a planting hole about a foot deep and about 18 inches wide and back fill with well rotted compost and a sprinkling of fish blood and bone. A tip I picked up from my dad is not to plant the canes to deep. The roots need to breathe so don’t be tempted to heal them in too vigorously. Also if at all possible plant them in full sun and the fruits will be all the more sweeter for it. Oh and one last thing … don’t plant them too close together. After all you want to be able to get to all those gorgeous fruits! Apologies for the poor quality of this image .. . I’ll take some better ones next weekend. Its hard work but well worth it! 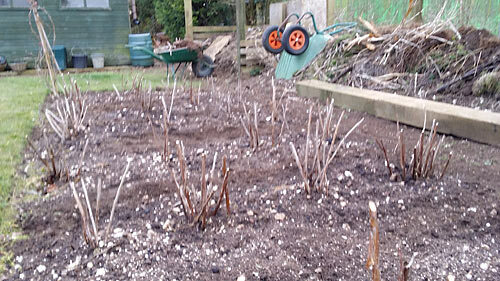 A busy weekend moving the Raspberry’s but very satisfying feeling now its done and it feels great to be back doing some serious gardening again!